Well exposed blacks and whites,an excellent in flight image. The first thought I had upon viewing this lovely image was that the exposure is perfect – gorgeous detail in both the whites and blacks. Very nice flight shot. Do these guys constantly chatter while flying like our Black-necked Stilts do? Beauty flight shot, love the eye and the overall image. Such a beauty- lovely detail and contrasts. Love that bright eye and the stretched out feet. Such beautiful and elegant birds! Captured superbly, KK. Perfect exposure for the black and white plumage. KK, Really well done exposing for darks and whites. Image quality if top notch. 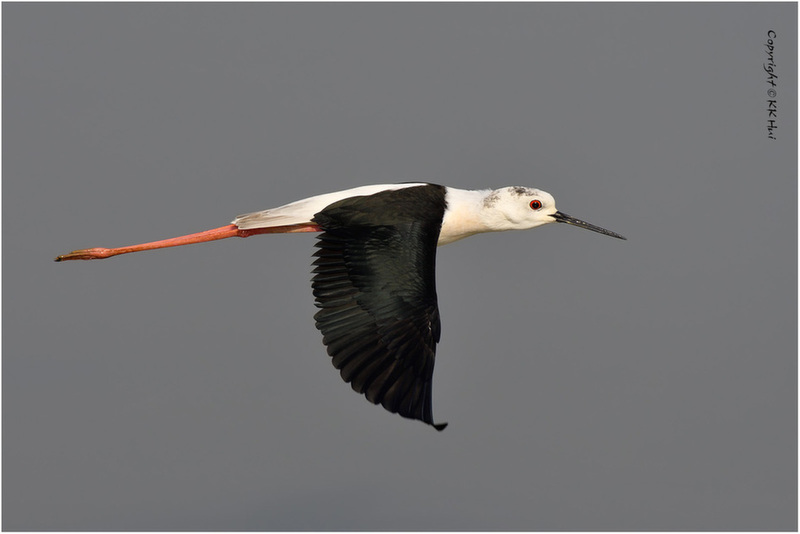 The Black-winged Stilt does chatter while flying too. Well captured right on your shadow line. Awesome flight shot with great eye contact sir. A beauty KK, love that eye. Nice stretched pose, yep the light is perfect.